It's time for another Zoya collection! 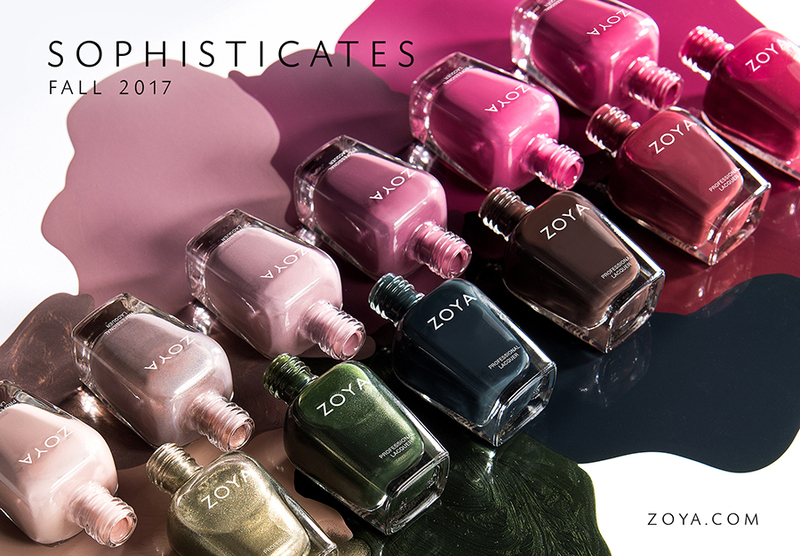 Starting in August, the Zoya Sophisticates Fall 2017 Collection will be available for purchase. Sophisticates is a twelve piece collection that is guaranteed to get you in the mood for hot drinks and warm sweaters. Mckenna - a refined pearl in soft almond. Beth - a soft, sandy, rose gold metallic. Presley - a smokey, mauve taupe cream. Hera - a muted, red mauve cream. Padma - a deep, vermillion red cream. Yvonne - a rich, bordeaux red cream. Mona - a deep, burgundy plum cream. Elaine - a dark, umber brown cream. Hadley - a smokey, midnight blue cream. Tabitha - a refined pearl in a deep hunter green. Gal - a smokey, iridescent, peridot gold metallic. All shades will be available for purchase on August 1st, 2017 for $10/bottle. If you enjoyed this post you might like Zoya Naturel 3 Collection and Zoya Wanderlust Collection Summer 2017 Pt 2.